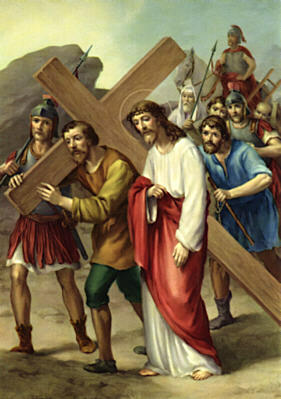 Simon of Cyrene is forced to help Jesus to carry His cross to Calvary. Simon was just a bystander watching what was going on with Jesus. Simon did not plan on helping Jesus and becoming part of His journey. Jesus was not moving as fast as the soldiers wanted and was becoming weaker and weaker with each step. They knew He would not be able to do this Himself and longer so they pulled Simon from the crowd and forced him to help. This station like the first can be seen from both persons. First being Jesus. Jesus is beaten down and tired, both physically, emotional and I wonder if spiritually as well. We know Jesus could have called on Heaven to give Him strength but He allowed another to help Him with His struggle. How good are you at asking for help when going through something? Are you able to ask someone to help with a task that you will need help with? I must admit that this I am not good at. I do not ask for help and if I am asked if I need help I will say no but Thank You for asking and continue on. I know this is not something that is a good trait in myself. If Jesus was able to accept help I also need to learn to do that as well. I must be able to humble myself as Jesus shows us all to do and ask and accept that help from others. People feel needed and wanted when we allow them to help. It shows that we trust and need them in our lives. It is not showing a weakness but a strength. The second perspective is that of Simon. Simon had no intention of helping Jesus but is forced to by the soldiers. Have you watched someone who needed help and did nothing to help them? Have you given excuses so you would not have to help someone? We are all called to help others. Jesus helped those He knew and also those who He did not know. There are plenty of ways we can help others. We are able to help other by bring food and drink to those in need and bring clothes to them as well. There are many organizations that ask for our help both monetarily and physically. It is up to us to be the hands and feet of Jesus today on earth by helping others. No one will force us like they did Simon. Look around you and see what you can do to help others in need. Until tomorrow, God Bless, and may you find ways to help and be helped by others.